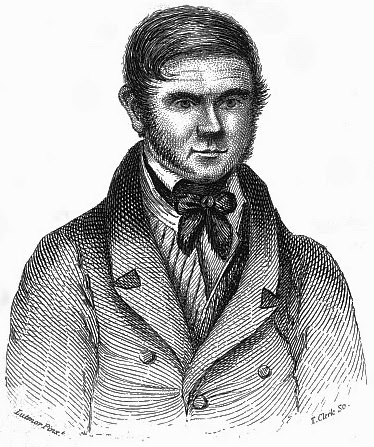 William Burke on trial, 1829. In the 19th century, Edinburgh had a problem: although it was a world-renowned centre of medical science and anatomical research, it had a shortage of bodies for dissection. The main source of legal cadavers, executed criminals, was dwindling, and while body-snatchers (the ghoulishly termed Resurrectionists) did their best to keep up with demand by their covert exhumations, it was not enough and the universities were still left choked of good, clean, healthy bodies to open, probe and pick apart. Cue the entrance of the entrepreneurial Irishmen William Burke and William Hare, who simply cut out the middleman (death by natural causes), delivering straight from murder scene to dissection table in a matter of hours. William Hare giving evidence, 1829. While there is a morbid interest and fascination in the activities of Burke and Hare (even in Edinburgh, which proudly advertises their gruesome misdeeds to cooing tourists), these were, as if it needed to be spelt out, men of quite horrific brutality. They stumbled somewhat into their murderous careers when a pensioner they knew died of natural causes. No doubt aware of the need for cadavers (the Resurrectionists' work was well-known and the subject of ardent public revulsion), they sold the poor man's mortal remains to a Dr Robert Knox for £7.10s. From that moment, unwilling to idly wait for acquaintances to die of their own accord, Burke and Hare embarked on a murderous campaign that would last ten months and claim at least sixteen victims. Their usual method was to lure the victims back to their lodgings, ply them with alcohol, and then strangle or suffocate them. Their victims were usually working-class women, but also included an 18-year-old man who suffered from some form of intellectual disability and a mute 12-year-old boy. Their crimes were detected after a body was discovered in Burke's house. It was generally agreed that Burke, being the more intelligent of the two, was the brains of the operation, and so Hare was offered immunity from prosecution if he confessed and testified against Burke. He did, and Burke was convicted and sentenced to death. 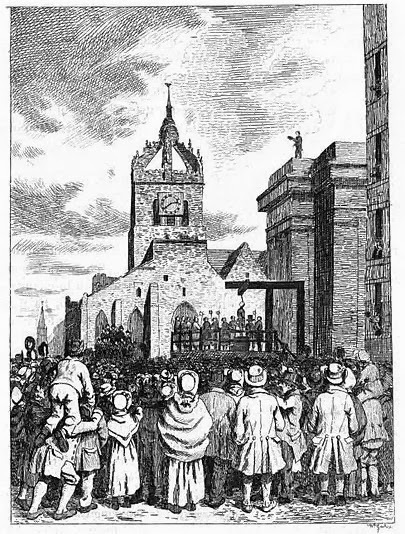 He was hanged on the 28th January 1829 before a crowd of over 20,000 onlookers. The following day his body was publicly dissected to a sell-out audience, and his skeleton in still displayed in the University of Edinburgh's Anatomy Museum. 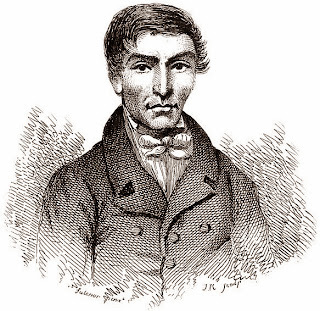 William Hare left Edinburgh and, after several sightings, he disappeared from public view altogether; his ultimate fate remains unknown. 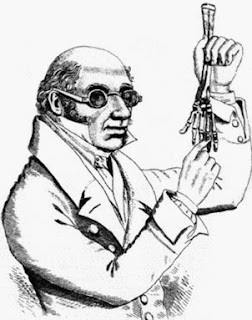 Dr Knox, while legally cleared of any implication in the crimes, was found guilty in the court of public opinion (probably not least because he was one creepy looking guy) and his reputation, business and research suffered irreparable damage. So is that sort of thing still illegal in Scotland? I ask because I like alcohol, and being lured, and I don't use my left arm that much. Yes it is, C, and I'm as furious about it as you ... that's bloomin' socialist nanny-states for you, eh? Trampling all over the common man. Tsk. Very interesting! And how ironic, his skeleton is still on display; the ultimate punishment. I know! I'd love to know if there's any record to how he felt about that - condemned criminals were often told their bodies would be sent for dissection, and I'm pretty sure some gleeful jailer would have relished the opportunity to point out the poetic justice in his educational future. Oh, My! What an ending to that fellow's, er, career. Gads. Life was sure different then. Now-a-days it seems murderers have more rights than those they've dispatched. He did get what was coming to him. Unfortunately, a number of other involved in the case didn't, including Hare. Wow. I've often heard people describe someone as "a bit of a burke". I thought it meant he was a bit of an idiot, someone who's not the sharpest knife in the drawer. I had no idea they meant he was a bit of a lurer of working class women and intellectually disabled teenagers to their deaths by suffocation or strangulation. I'm not going to use that term quite as much in the future. Well you'll be pleased to know that it doesn't mean that and is, in actual fact, "berk," which was one of the "acceptable" insults we were allowed to use in our house as kids. However, "berk" is cockney rhyming slang for "Berkeley Hunt", which ultimately means ... well ... umm ... I'll let you figure it out, and the answer might tell you why, as interesting as it is, I skipped berk while working my way through B in Lexicolatry.